Who would have guessed this ordinary machine had a special type. 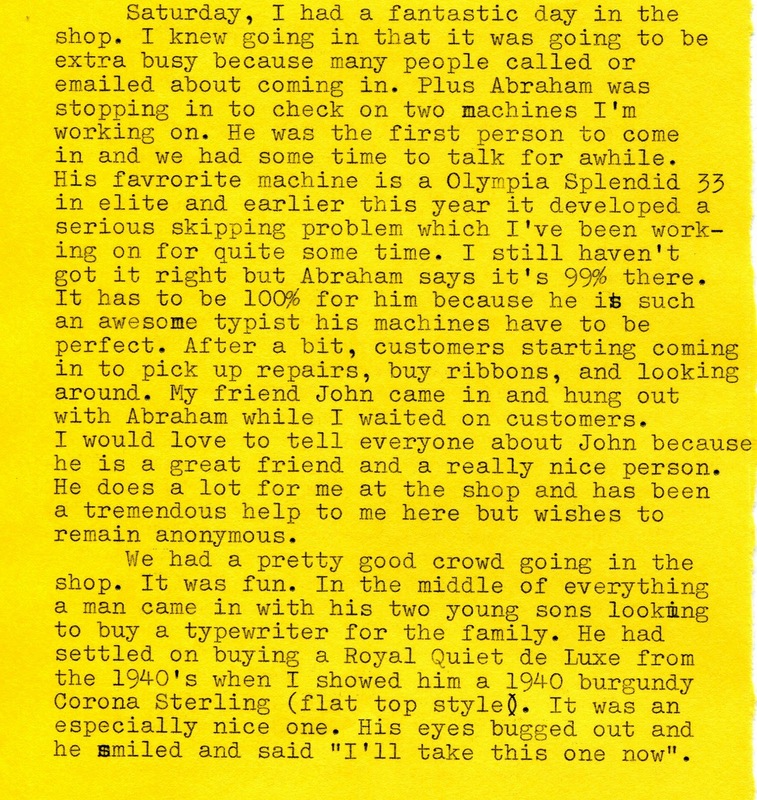 Abraham checks out his Splendid 33. My second typecasting machine is a Olympia Splendid. That typeface is amazing! Who knows what lurks under the hoods of the many Royals that pop up on ebay? Out of curiosity, what percentage of machines do you see that have something other than an average typeface? Your posts always inspire me as a typewriter enthusiast. 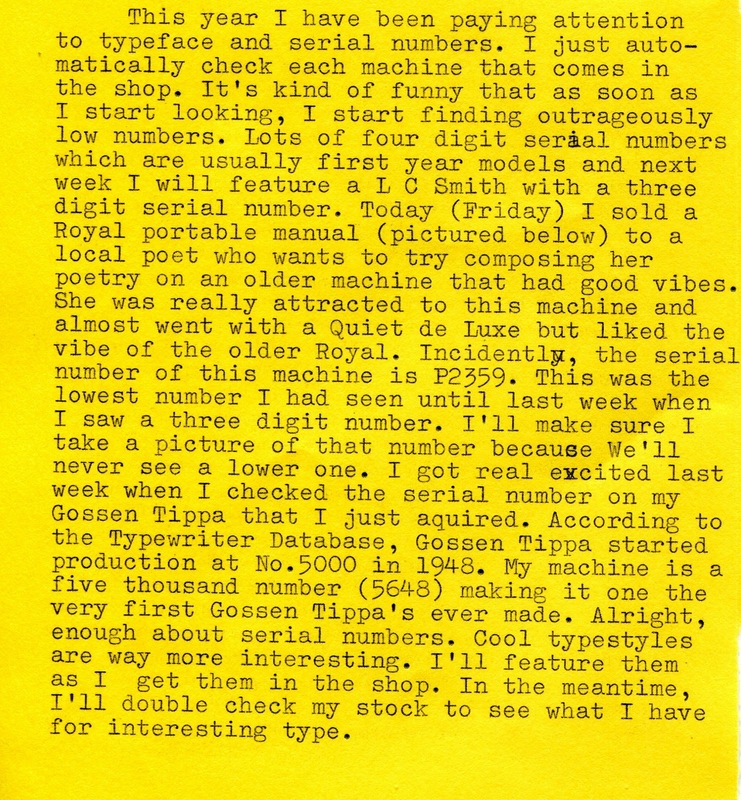 Do you think that skipping problems might be the most challenging of typewriter issues to solve? They seem to come from various sources, and can be elusive to spot. I have several with this problem and I am hesitant to experiment on them myself. You seem to be a magnet for people with historic typewriters in your area. This is not surprising, given your enthusiasm and expertise. Word tends to spread. 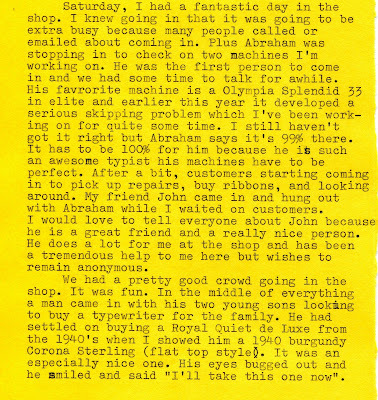 It is reassuring to know that there are still typewriter repair people like you out there! 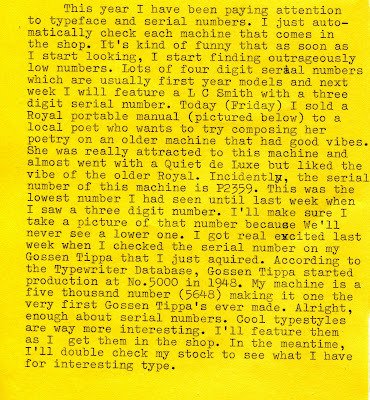 Dwayne F.- I would say less than 5% of all machines I see are a special typeface. It makes finding them all the more special. Cameron- Thanks for your kind comments. Skipping problems can drive me nuts. Sometimes I can lose sleep over a really tough one. You have to use caution because many times you can make it worse. I think my shop is a huge typewriter magnet and every machine within 200 miles is pulled towards it. Actually, I think the Boston area just has a higher percentage of typewriters than other parts of the country. What fun to discover that typeface and the early Royal portable. Another good typecast! That typeface is beautiful! How lucky for you to see it and use it for just a few minutes...The capital W is very special, indeed. What other typefaces have you seen out there that are rare finds? Very nice typeface. Every time I visit your blog I long for the days I still lived in the Northeast. It'd be a blast to visit your shop. The Royal art deco typeface is just wonderful! And I if visited your shop, I would feel like a kid in a candy store. Once the closes behind me back, my first thought would "I want one of each"! Richard- Thanks. I thought you might like that art deco look. JujyCakes- I do see some different kinds of Italic and boldface style types. But nothing as exciting as this one. 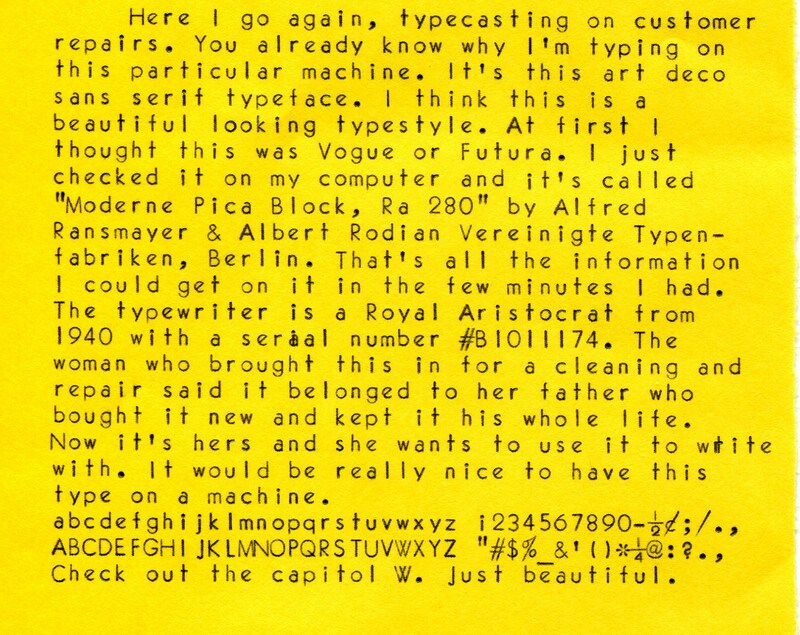 Ted- It's not easy to get info on old typestyles. Thanks for checking. Bill M.- Thanks for you nice comments. If you ever come back to visit friends you'd better stop by. Fernando- You wouldn't believe how many people do just that. Hey Rob- Aces to you too! Thanks! I bought a Royal Arrow online and it has this typeface! According to the serial number, it was made in 1941. Before now, I thought that all manual typewriters had Courier font because I don't remember EVER seeing one with anything different. Imagine my shock when I started typing. It probably hasn't been used in a very long time because when I started typing on it, the carriage wouldn't advance at all. It's doing better now, but it sticks a little bit when you get to the middle of the page, so I probably need to take it to get cleaned - and I need a new ribbon. 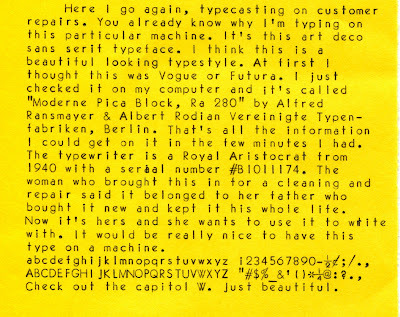 Thanks for the info about this typeface. I loved my typewriter from the moment I opened the case, but this makes it even more special to me.